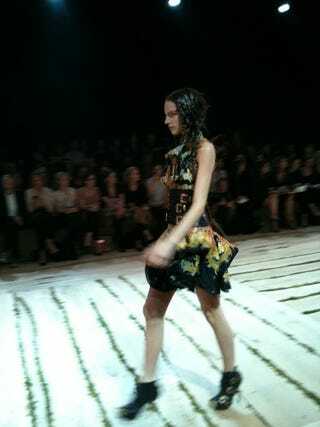 Fashion folks in Paris are all a-Twitter over Sarah Burton's first collection for McQueen. It features models with woven hair, deconstructed tailoring, feathers, Anna Dello Russo in a centurion's helmet, and a bustier that looks like a golden chest plate. About an hour ago, the New York Times' The Moment Tweeted this backstage shot of two heavily feathered dresses. Followed by this picture of model Lisanne de Jong in hair and makeup backstage. The London FW Twitter says that "the term for this kind of braided hair mats is an Egyptian-style headdress," but we prefer "hair-snood." Allure snapped an action shot. It seems like the look is indeed mostly the girls' real hair. Yikes. The International Herald-Tribune's Jessica Michault got a picture of Vogue Nippon's Anna Dello Russo in an enormous Philip Treacy hat. "Happy I am not sitting right behind her!" Michault observed. Alas, there was no live stream for McQueen this season, so the "best" "real-time" "information" comes from Twitter. Anticipation for this show was perhaps higher than for any other of the season. Fashion TV's Jeanne Beker Tweeted, "The buzz is that the clothes are phenomenal. I"m sure Lee will be there, watching every look..."
According to Women's Wear Daily, PPR group head François-Henri Pinault, whose Gucci group owns McQueen, sat front-row with his wife, Salma Hayek. I'm not going to post any more runway Twitpics here — I think these clothes really deserve to be seen in a medium of a quality more likely to reflect their beauty — but Michault's Twitpic feed has several more snapshots for the curious. Hint reports that the show ended with a standing ovation. We'll have a full review posted just as soon as pictures hit the wires.